Radical cystectomy (RC) with extended lymph node dissection (ELND) and urinary diversion (UD) is the standard of care for treatment of localised muscle-invasive BC.3,4 Radical cystectomy has traditionally been performed by open surgery. However, since the advent of laparoscopy and robotic-assisted LRC, there has been a worldwide shift towards minimally invasive surgical procedures. Our institution, a tertiary centre serving a mainly indigent population, is currently one of few centres in South Africa (SA) performing RC using laparoscopy. We aim to present our data comparing all open and laparoscopic radical cystectomies performed by a single surgeon in order to highlight the possible advantages of performing LRC. Approval was obtained from the Human Research Ethics Committee of the Faculty of Health Sciences of the University of Cape Town. The folders of all patients undergoing ORC and LRC performed at our centre from 2007-2013 were requested, and those available were retrospectively reviewed. Only patients with complete data sets were included in the study. The data that was collected included demographics, so as to confirm that the cohorts being compared were age-matched. We also compared the prevalence of comorbidities in the two groups. Data pertaining to operative duration (including UD) was reviewed, as well as peri- and postoperative complications. Complications were documented according to the Clavien-Dindo Classification. Specific complications that were examined more in-depth included intraoperative blood loss, wound complications, postoperative ileus, as well as data on oncological control, such as number of lymph nodes obtained, number of positive lymph nodes, and margin positivity. Pre- and postoperative staging data were compared. The basic principles of surgery for the treatment of bladder cancer were applied to both surgical methods used. This included a modified ELND (up to the level of the mid-common iliac vessels, excluding presacral lymph node sampling), removal of the bladder (and all macroscopic tumour around the bladder), removal of the uterus in females or the prostate and seminal vesicles in males, with or without a urethrectomy.3 Extra-corporeal UD was then performed by way of an ileal conduit (as per surgeon preference). Positioning differs for ORC as compared to LRC. During ORC, the patient is placed in Lloyd-Davis (low lithotomy) position, with mild Trendelenburg (head down) positioning to facilitate the surgery. During LRC, the patient is also placed in Lloyd-Davis position, but the patient is required to be placed in steep Trendelenburg position, which may be associated with increased risk of intraoperative complications. These include raised airway pressure with atelectasis, cerebral and facial oedema, raised intra-ocular pressure, and traction on lower limbs with neuropraxia.10,11 No documented cases of these complications were noted in this cohort of patients. Continuous variables were reported using medians and interquartile ranges. Categorical variables were reported as a percentage of the total and proportion of the main subset. Continuous variables were compared by Mann-Whitney U test. Categorical variables were compared between groups by Fisher's exact test. Spearman's correlation coefficients were calculated to assess potential associations between continuous variables. No adjustment for multiple comparisons was used, given the small sample size and the hypothesis-generating nature of the study. Two-sided p-values < 0.05 were considered significant. All analyses were performed using GraphPad Prism v5.0 (La Jolla, CA). Seventy-five patients underwent RC from January 2007 to February 2013 at GSH, Cape Town. Of these 75, 39 were operated on using laparoscopic technique and 35 underwent ORC. Thirty (30) patients from the laparoscopic arm were included as participants in this study while 32 from the open arm were included. Thirteen (13) patients were excluded based on the lack of data. One patient was excluded as the patient was converted from LRC to ORC relatively early in the procedure. A significantly higher proportion of men underwent laparoscopic surgery when compared to women (83.3% versus 16.7% respectively, p=0.02), while the gender balance was approaching symmetry in the open arm (56.3% male versus 43.8% female). The mean age of participants included across the two arms did not differ (mean of 61 for laparoscopic surgery and 60 for open surgery). Moreover, when classified according to gender and comparing across the two arms, there was no difference in age observed. Of the 30 participants included in the laparoscopic arm, 45% presented with comorbidities, while 55% of patients in the open arm had pre-existing conditions. These were mainly medical in nature. Two patients in the open group were known with ischaemic heart disease, as opposed to only 1 patient in the laparoscopic group. One patient in each arm had suffered a prior cerebrovascular accident. The leading comorbidity was hypertension. On preoperative screening (ultrasound), there was no difference in the prevalence of hydronephrosis. Every patient referred for RC underwent an examination under anaesthesia (EUA) and a transurethral resection of the bladder tumour. The EUA findings suggest that patients with higher stage disease were more likely to undergo open surgery as opposed to laparoscopic (59% having a palpable mass on EUA in the open group versus 36% in the laparoscopic group, p=0.08). The duration of the two procedures differed significantly with a mean duration of 382 minutes for the laparoscopic intervention as opposed to a mean of 301 minutes for open surgery. The duration documented included extra-corporeal formation of an ileal conduit for all cases. A significantly higher median volume of blood loss was encountered during the open intervention when compared to the laparoscopic one (1376 ml for open versus 779 ml for laparoscopic; Figure 1A). Of these patients, 38% of participants in the laparoscopic arm required transfusion compared to 64% of patients undergoing open surgery (p=0.10). The median number of units required for transfusion was 0 for the laparoscopic arm compared to 2 for the open arm (Figure 1B). There was no association between the detection of a mass at EUA and intraoperative bleeding. Three patients experienced intraoperative complications that were not haemorrhagic in nature. One participant from the laparoscopic group experienced acidosis secondary to hypoventilation and hypocarbia requiring postoperative intubation. A participant from the open group experienced rectal injury requiring colostomy. One patient in the laparoscopic group also experienced a rectal injury, which was repaired primarily intraoperatively and required no further intervention. On clinical staging, it was observed that significantly more participants were staged as T1/T2 disease in the laparoscopic arm compared to the open arm (87% versus 43%, p < 0.0001). More participants reported postoperative complications in the open group when compared to the laparoscopic group (61% for the open group compared to 43% for the laparoscopic group). This difference was however not statistically significant. 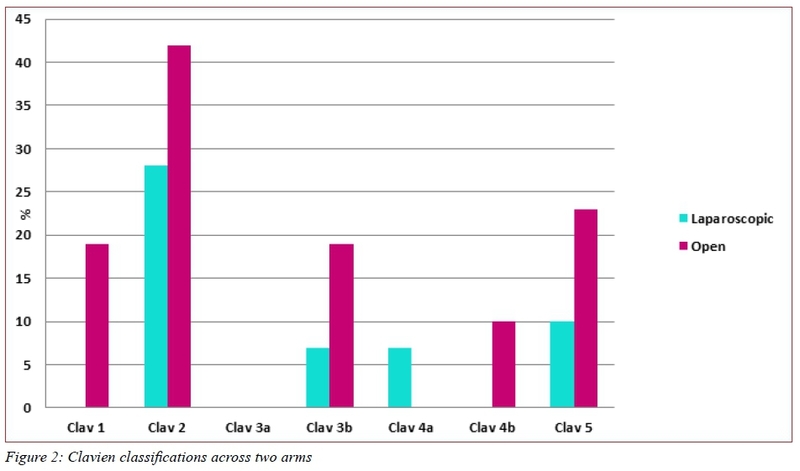 This trend was confirmed when the degree of complications (Clavien) was compared between the two arms (Figure 2). Participants who have reported a past medical history were significantly more at risk (risk ratio of 1.6) of experiencing postoperative complications (48% in participants with no medical history as compared to 77% for participants with a past medical history; p=0.04). When investigating further into the nature of the postoperative complications, it was observed that the only complication that differed in proportion between the two arms were those related to wound complications (18% for laparoscopic group versus 44% for the open group). The predominant wound complication was sepsis. Ileus was identified as the main gastrointestinal complication. One patient in the open group developed an anastomotic stricture requiring revision of the ileal conduit. This patient also experienced a rectal injury requiring a diverting colostomy. One patient in the laparoscopic group required a relook laparotomy for an anastomotic leak. There was no association between age of participants and the incidence of postoperative complications, irrespective of the type of procedure undergone. Participants with a mass on EUA were more likely to experience overall postoperative complications (60%) when compared to participants with no mass detected on EUA (47%), although this is not the case for wound complications specifically. When looking at the prevalence of postoperative complications among participants who experienced intraoperative complications compared to those who did not experience intraoperative complications, no difference was observed. Following the difference in clinical staging found when comparing the 2 arms, the pathological staging of the two groups was compared revealing no difference between the two arms. When comparing margin positivity in the two groups no difference was found when looking at clinical staging. However, a strong trend emerged where all positive margins were only encountered for stages T3 and T4 disease. The surgical modality used did not impact on this. 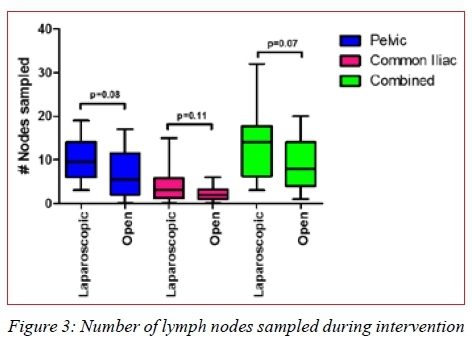 A trend was observed when comparing the number of lymph nodes sampled using the two techniques whereby a higher number of nodes was most often sampled for using the laparoscopic option in this study (Figure 3). Operative time was significantly less with open surgery, as has been seen in multiple previous studies.6,16-20 Bleeding was the commonest intraoperative complication. Blood loss and rates of transfusion were significantly lower in the laparoscopic group in our study. This is in line with the current data that is available when comparing these 2 modalities.16-21 The volume of blood loss was not increased by higher stage disease. Selection bias has been stated to be significant when comparing patients undergoing LRC versus ORC. Our results were not dissimilar, in that significantly more patients undergoing laparoscopic RC were Stage T1/T2 disease. However, our findings suggest that this does not necessarily impact on outcomes. The blood loss seen across all participants was greater in the patients with T1/T2 disease as compared to patients with T3/T4 disease. There was no other association with bleeding that could be found to explain this phenomenon. The overall survival rates are comparable in the 2 groups. However, given the relatively short follow-up period (median: 5 years ORC; 3 years LRC) and the small numbers of participants, it is not possible to accurately comment on overall survival. In terms of early postoperative mortality, it is apparent that the 2 groups have similar 1-month postoperative mortality rates. At least 50% of the patients who died from both groups had palliative cystectomies for advanced disease. Other causes of death included myocardial infarction in patients with pre-existing cardiac dysfunction, sudden death from presumed pulmonary emboli, as well as septic shock. All patients were managed as part of a multi-disciplinary team. One limitation of this study is the retrospective nature of the study. Unfortunately, a large number of folders were not accessible for various reasons. Due to this study design as well as the number of patients lost to follow-up, it is not possible to comment adequately on survival outcomes, but from using the available data alone, it is apparent that these outcomes are not affected by the surgical modality used. Another limitation noted is a deficiency in standardised documentation of patient progress reports in terms of time to first meal and time to passing stool. Being a referral centre for advanced BC serving a wide population distribution, several patients were seen at outlying hospitals for follow-up, thereby affecting the number and exact timing of documentation of postoperative complications. Another limitation is the relatively small numbers of participants in the study. The discrepancy in follow-up times between the 2 groups, whereby the open group has a longer follow-up time (median: 5 years) when compared to the laparoscopic group (median: 3 years), is an additional limitation. Also, due to the nature of the disease process, and the stage at which patients present in our setting, it is difficult to always compare these cases without confounding factors being present. Given that minimally invasive surgery has been developed to improve postoperative pain and shorten hospital stay, the lack of these data is also a limitation. The benefit, however, of assessing data from a single surgeon eliminates possible differences in surgical technique that may be considered to be the cause of differences in complications and outcomes. Although generalisability is not possible, for the purposes of this study, it is possible to show feasibility of one surgeon performing both techniques with similar outcomes. With this study documenting the early experience of LRC in our centre we are able to conclude that LRC is associated with a decreased need for blood transfusions. Open RC is associated with shorter operative time. The two options are similar in terms of complication rates and oncological outcomes. Laparoscopic RC is therefore a feasible option in our setting. Given the number of patients who have subsequently undergone LRC at GSH since the completion of this study, it is clear that the number of potential participants for a future study may allow for more definitive statements to be made regarding which modality may provide better outcomes. The volume of RC currently being performed at our centre may allow for a prospective study design, thereby producing more robust evidence, which may guide practice in the future.